Color me proud AF to be "on maiden voyage of Hysterical"! Christina Shideler, whatta beautiful baby you have! We’ll be reading and writing thrilling poems about true crime, horror, suspense and noir. We have a few spots left, and a GREAT group of poets. Click here to read more/sign up. …in which we discuss music and poetry. How important is music to your poetry? Can one exist without the other? Thank you so much for the close read, Frank Podmore! I’m honored! “Massive chicken of the woods in the cupcake lady’s yard,” Collin texted me on his way to work. On the left, hen of the woods; on the right: cupcake lady’s chicken of the woods. I slipped on flop flops, grabbed my adorable mushroom knife, and marched down to the corner where the cupcake lady lives. She sells these amazing cupcakes at the booth next to ours called the Sweet Shoppe at the Ames Main Street Farmers Market. The garage door was open, and she was in a flurry to get to work. ”Hi!” she called back but never stopped moving. “I heard you have a big mushroom in your yard,” I said. “No!” she declared without a moment’s thought. I found it on the front lawn, big as a beach ball, blazing like an exploded atomic pumpkin. “What is that?!?! Where did you find it?!? !” she asked when I held it up to show her. On the way home, I cut through my favorite hen of the woods spot and found another mother load. The rain moved in as soon as I walked in the door. Whatever happens next, it’s a good day. This is a chapter about mushrooms and mycophiles from the culinary biography I’m working on. This is a story in the Des Moines Register about the Prairie State Mushroom Banquet I co-hosted with my friend and mushroom sensei, Barbara Ching. “I’m in poetry for the money.” I like to tell that joke before I read to a crowd because it’s so obviously ridiculous. When I lived in New York for 14 years after obtaining my MFA in poetry writing, I couldn’t afford to teach in an adjunct capacity, as I do now. So I worked in communications as a writer and graphic designer. It was a job I’d had before grad school that engaged me creatively (I’ve loved commercials and advertising since I was a kid) although I NEVER had a client who wanted to do anything creative. So when I started making seasoning salts as holiday gifts in 2012, I had no idea that one day, I’d be my own client. And I’d get to do whatever I wanted. And that people would like it! Amazing! It feels so good to know that all the time I put in learning about that world has paid off—not just monetarily, but creatively, as well. No work is wasted. Part 5 of the Miniest Mini Interview Ever! How does your work first enter the world? Do you have a social group or writers group that you work ideas and poems with? I'm extremely grateful to have two poets I share work with. We 100 years ago met in graduate school and know the trajectory of each other's work very well. 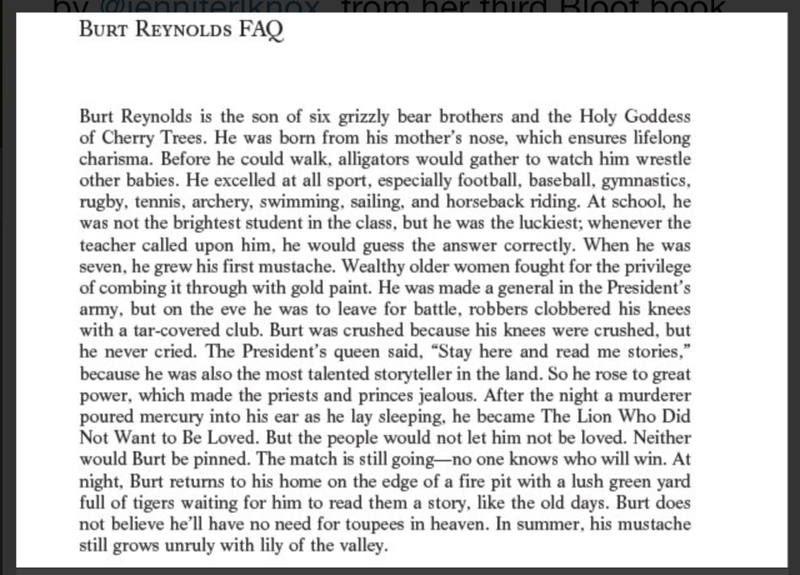 "Why does Burt Reynolds remind me of you? You have a poem, no?" Trish texts. "Did you see he just died :("
Then my phone lit up with text after text. "Burt Reynolds has left the building." A poet friend of mine asked if I was going to blog about poetry, since it is the BAP blog, afterall. But to me that feels a little like talking about corgis, to a corgi. Today I wanna to chase sheep. Scoliosis and bipolar disorders run like rabid squirrels between the twining branches of my family trees. Charles Browning based the painting on the cover of my last book on Burt's 1972 Cosmo bearskin rug photoshoot.